This week our blog guest in the series ‘Narratives from Camberwell’ are MA Book Arts students. Here they introduce their new artist book catalogue, Book Is. We invited a cross section of 18 influential conceptual artists, book artists, designer bookbinders and writers to contribute to our own on-going investigations into what Book Is. The undefined nature of Book has offered all 14 graduating students this year rich sources to interrogate, explore, express and interpret Book across a range of conceptual themes such as memory and place, obscurity, visual poetry, appropriation, sequence and much more. Tasked with reducing 12-24 months of exploration into a confined space of a folded sheet we all set out to hand make a collective artists book on uncoated paper in an edition of 100. This proved quite challenging for some especially where some artists work was of a three dimensional or performative nature, but nonetheless this was achieved in no less than two months with enough time left to focus on the work for our final show. In keeping with breaking conventions of what Book Is, we also decided that the ‘Artist Book’ catalogue should remain unbound and unglued and we therefore followed through with a folded structure and loose sheets that lent itself to multiple narratives through text, imagery, page structures and materials chosen by each artist. 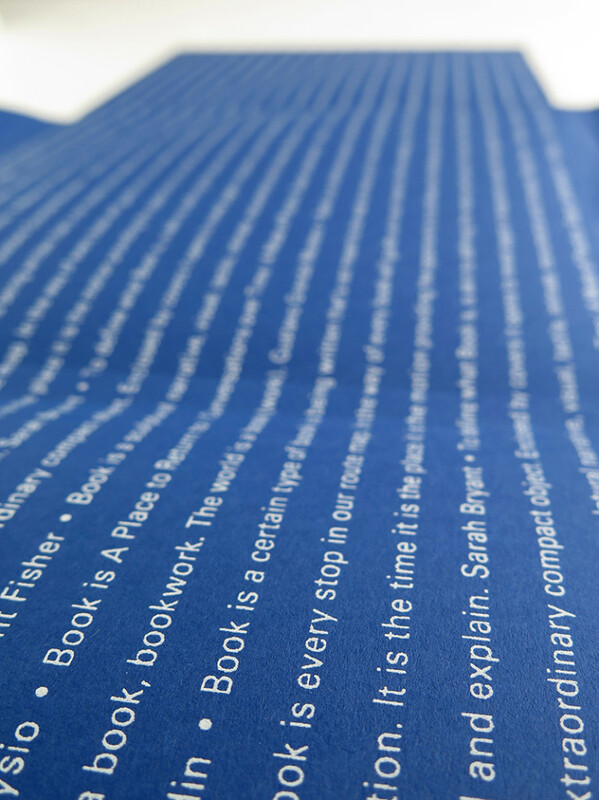 The Artists Book Catalogue is an edition of 100 with a screen printed cover listing the above quotes from 18 influential artists. 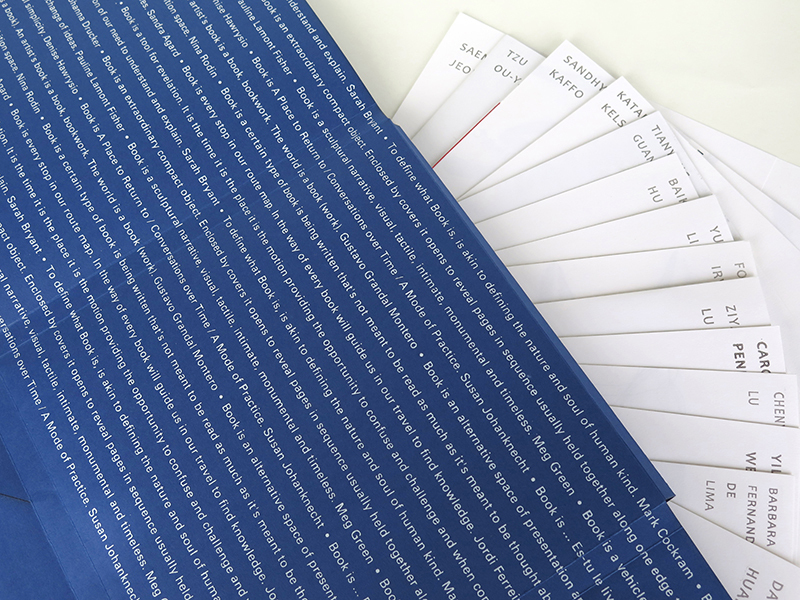 It contains 14 hand-made loose sheets of the themes of our individual work and a leaflet containing a synopsis of each artists work that will be exhibited at the ‘Book Is’ Show 16-22 July 2015. 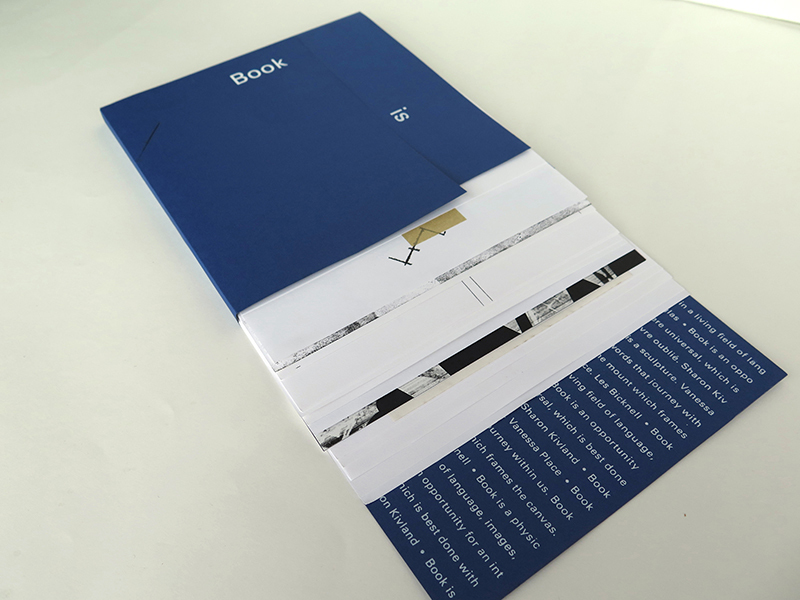 The Artists Book Catalogue is for sale at the Private View on 16 July 6-9 pm at a giveaway price of just £10 and pre-orders are being taken for collection at the Private View through Katarina Kelsey at the following email address- k.kelsey1@arts.ac.uk. There will be a Raffle Ticket Draw on the night and tickets will be available at the Show Shop. One lucky winner will win a Catalogue amongst some other Artist Book goodies.